Since September is Prostate Cancer Awareness Month, we decided to feature prostate cancer to help raise awareness to our readers. Prostate cancer has been the leading cause of cancer death among men in the US. It affects men of all races, most notably those of African-American origin. Based on the National Cancer Institute, there are 233, 000 new cases in the US and 29, 480 deaths recorded in 2014. There has been a steady rise from 209,292 new cases and 27, 970 deaths in 2011 based on CDC statistics. One reason for its high mortality is being asymptomatic. Since prostate cancer is touted as a silent disease, men are urged to undergo regular screening and lab tests as soon as they reach 40. The risk of acquiring prostate cancer increases with age. Men aged 65 and older were commonly found to have the disease. It accounts for 65% of the diagnosis. The incidence is also higher once a family member has it, all the more if it was diagnosed before the age of 65. It most often afflicts ethnic and racial groups, particularly those belonging in the African race. Prostate cancer is indeed curable. The key here is early detection. The cure rate is very high at 90%. Almost all men diagnosed with prostate cancer becomes cancer-free after five years. Two of the most common tests administered include the prostate specific antigen (PSA) test and the digital rectal exam (DRE). High PSA levels indicate prostate problems, but not necessarily cancer. An enlarged prostate or any lumps can also be detected by DRE. 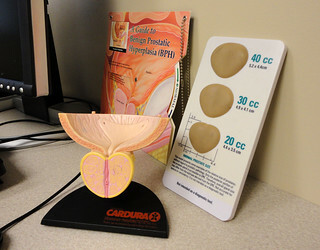 To diagnose prostate cancer, the doctor may request for a biopsy. There are many options for treating prostate cancer. Radiation therapy, hormone therapy, chemotherapy, biological therapy and cryotherapy may be elected. Surgery to remove the prostate and the surrounding tissues may also be recommended. The National Cancer Insititute and the National Institutes of Health work hand in hand to develop certain drugs and other treatment options for prostate cancer. The Prostate Cancer Foundation also helps raise funds for further clinical studies. The efforts of these organizations resulted in several important discoveries in the past 20 years. Galeterone, also known as VN/124-1, is a newly developed medicine for prostate cancer. The compound was first developed in 1996 by Angela Brodie and Vincent Njar of the University of Maryland. Currently, galeterone is undergoing clinical trials at the Sidney Kimmel Comprehensive Cancer Center. Although it is still in its early stages, the drug has shown very promising results. There are two hormones closely linked to the development of prostate cancer – testosterone and dihydrotestosterone. Galeterone works by decreasing androgen production, prevents its binding with androgen receptors and damaging the receptors as well. The drug was originally developed for breast cancer to decrease the production of estrogen. Presently, galeterone is in its third phase of the trial. Its efficacy will be compared with the other drugs. So far, it has been found to have lesser adverse effects than other chemotherapy drugs.